Grantsville, had stopped for dinner. He was around gathering up wool in the neighborhood to take down to his son's fulling mill. When he found out what project we had in view he volunteered to become our bugleman and act as our captain, as he had been a soldier in the old country and knew somewhat yet of military tactics. By evening time we had made up a company of ten men, armed with rifles, shotguns, and a few old single-barrel pistols. The Squad was composed of Grandpa Bittner, Capt; John Hetrick and Jos. Kaupp (Kolb? 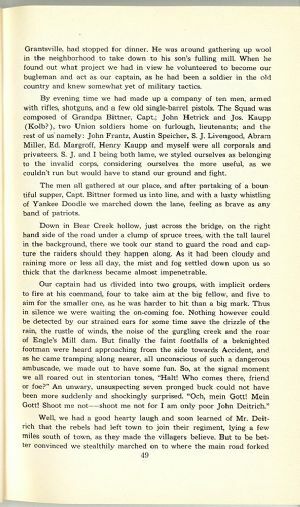 ), two Union soldiers home on furlough, lieutenants; and the rest of us, namely: John Frantz, Austin Speicher, S. J. Livengood, Abram Miller, Ed. Margroff, Henry Kaupp and myself were all corporals and privateers. S. J. and I being both lame, we styled ourselves as belonging to the invalid corps, considering ourselves the more useful, as we couldn't run but would have to stand our ground and fight. The men all gathered at our place, and after partaking of a bountiful supper, Capt. Bittner formed us into line, and with a lusty whistling of Yankee Doodle we marched down the lane, feeling as brave as any band of patriots. Down in Bear Creek hollow, just across the bridge, on the right hand side of the road under a clump of spruce trees, with the tall laurel in the background, there we took our stand to guard the road and capture the raiders should they happen along. As it had been cloudy and raining more or less all day, the mist and fog settled down upon us so thick that the darkness became almost impenetrable. Our captain had us divided into two groups, with implicit orders to fire at his command, four to take aim at the big fellow, and five to aim for the smaller one, as he was harder to hit than a big mark. Thus in silence we were waiting the on-coming foe. Nothing however could be detected by our strained ears for some time save the drizzle of the rain, the rustle of winds, the noise of the gurgling creek and the roar of Engle's Mill dam. But finally the faint footfalls of a beknighted footman were heard approaching from the side towards Accident, and as he came tramping along nearer, all unconscious of such a dangerous ambuscade, we made out to have some fun. So, at the signal moment we all roared out in stentorian tones, "Halt! Who comes there, friend or foe?" An unwary, unsuspecting seven pronged buck could not have been more suddenly and shockingly surprised. "Och, mein Gott! Mein Gott! Shoot me not--shoot me not for I am only poor John Deitrich."